South London is an incredibly diverse region, and is home to numerous different ethnicities that all contribute something different to the areas that they call home. There a number of different avenues through which different groups access each others cultures, and are able, to some extent, experience them. These include mediums like visual art and music, however, we're not here to talk about them, though they are worthy of discussion, no, we're going to be talk about a more overtly sensational medium - food. Though you can taste similarities between different cuisines, each and all have something about them that sets them apart - be it a reliance on particular ingredients native to the country/region, or a signature popular dish. There are even some cuisines that have become so established here that the food served on these shores has been altered, and there are dishes served that were developed in the UK - see chicken tikka masala. So here is a list of 25 different cuisines that you can try in South London. An independent Brazilian restaurant in Brixton, Cabana is the perfect place to get stuck into some fantastic Brazilian food. In their relaxed yet energetic environment, enjoy some guava-cue chicken or guava-cue ribs, which wonderfully utilise the flavour of the guava fruit, a popular ingredient in Brazil. Don't worry if you've never tried Brazilian food before, your South London Club Card means you get 20% off everything, so there really is no reason not to give it a go. Though Legacy also serves Sierra Leonean cuisine alongside Nigerian food, it markets itself as a Nigerian restaurant and bar, so for the sake of keeping it simple, we'll call it a Nigerian restaurant. If you haven't tried Nigerian food before, expect a lot of plantain, plenty of stews and rice, and, if your really feeling adventurous, a Nigerian Guinness. We're also quite sure, only quite though, that this will all taste quite a bit better when you get 15% off with your South London Club Card. Opened relatively recently in 2015, as part of the burgeoning Brockley gastronomic scene, Noak describes itself as a 'somewhat' Scandinavian bakery, eatery, and pizza place. Now we think the 'somewhat' comes from the fact that they serve pizza, which is not a traditional Scandinavian food. However, they do serve number of traditional dishes like the pictured smørrebrød, a Danish open sandwich served on rugbrød, a common bread in Denmark. These Danish delights are also available at an exceptionally reasonable price when you get 15% off with your South London Club Card. Not only is Ginger Kiss one of the finest independent Thai restaurants in all of South London, it's also a very fine bistro and cocktail lounge. Using only the best ingredients, Ginger Kiss has made a name for itself by serving Western-influence hybrids like their Kiss Burger, which uses a blend of rice, chilli, mint, lime and shallots. They refuse to use MSG, as all self-respecting restaurants should, and we admire that attitude, so much so, that we've partnered with them to give you 20% off Monday-Thursday and 10% off Friday-Saturday as part of your South London Club Card. Italian food is pretty well established across the world, but it hasn't always been the case. Ask anyone who was alive before the 60s, or can at least remember the 60s, about the time that pizza became popular in the UK. It's quite weird. It's so established that we take it for granted that there was a time when it wasn't really a thing. Anyway, Luciano's in Lee is one of our favourite Italian restaurants in South London, and you get 10% off your bill at anytime with your South London Club Card. Owner and chef Garfield Davis is a legend of the South London Caribbean food scene. Back when Ready Steady Cook was on our screens, testing the abilities of those who were able to cook good food quickly, Davis was a contestant. He's taken those skills and made it into a very successful restaurant, serving some of the finest authentic jerk food this side of the river. You also get 10% off with your South London Club Card. Unlike the other establishments on this list, The Sausage Man is not a restaurant. They do have a mobile unit from which they sell their beautiful sausages from, but they are primarily a butchers who import a wide variety of sausages from across Germany, as you might expect with a name like The Sausage Man. If you want to get some fine German sausages, there are few better places in South London, and you get 10% off everything with your South London Club Card. There is one thing that Ethiopian food is particularly good at, without even having to try, and that is vegetarian and vegan food. 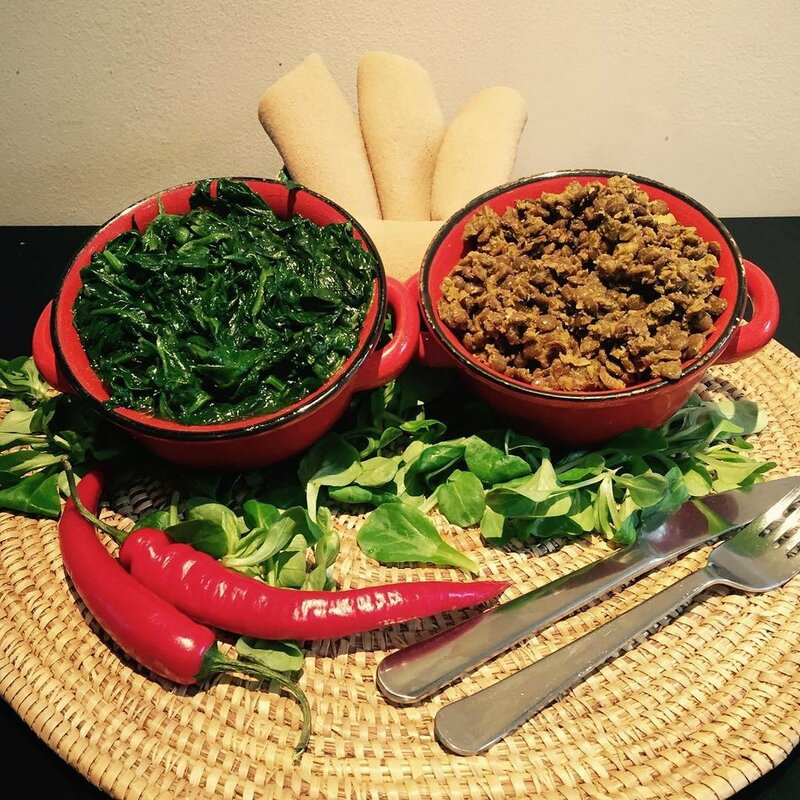 Beza does also serve plenty of food for meat-lovers, but if you are a vegan, Ethiopian food is certainly something you should try. When you do try it, remember to bring your South London Club Card, which gets you 10% off. We should be honest, Bento isn't just a Chinese restaurant, it's also a Japanese restaurant. We've included it as a Chinese restaurant on this list because there are other specifically Japanese restaurants on this list, and the more the merrier. Not a huge amount needs to be said about Chinese food, if you have somehow haven't tried it we would be very surprised. Anyway, Bento serves some pretty great Chinese food, and you get 10% off with your South London Club Card. Okay, so Italian-American food, what is it? Well, as you might expect it's largely Italian cuisine that essentially uses the best ingredients that the US has to offer. So expect ribs, hot dogs and burgers, featuring a lot of pastrami and Italian cheese, which transform quite bland fast food into a fun gastronomic experience. What's more, you get 10% off with your South London Club Card. We recently did an article that compiled what we thought were the best Vietnamese restaurants in South London were, and we featured Cafe Green on that list. We're big fans of Cafe Green, as they serve very lovingly-made food which is utterly authentic. We think that businesses like this need to be supported, and so we've partnered with Cafe Green to offer you 10% with your South London Club Card. Though marketed as a deli, Malaysian Deli operates like a restaurant as well, in that it uses the ingredients it sells to actually make dishes to serve to you. On their menu you'll find plenty of traditional Malaysian dishes like rendang and nasi lemak (both spicy meat dishes). Most people we know haven't tried Malaysian food, and it's always fun to try something new, so get down to Malaysian Deli, and bring your South London Club Card, which gets you 10% off everything. Do you like waffles? Do you like crepes? If you answer yes to either of these questions, then Belgian Brasserie is a cafe that you would most certainly have a good time at. This is an independent cafe that specialises in things that Belgians are very good at - crepes and waffles. They specialise in sweet delights, while we specialise in getting you great deals at great restaurants, and in this case you get 10% off with you South London Club Card. Established in 1994, The Bengal Clipper is an absolutely fantastic dining experience from start to finish. As you approach the restaurant you'll be struck by the remarkable Cardamom Buildings it is situated in, and when you're in, you'll be taken away by the wonderful food they serve. Not much needs to be said about Indian food, we will be gobsmacked if you haven't had it at least once. If you somehow haven't, this is a good place to start, particularly because you get 10% off with your South London Club Card. In a complete reverse to what we just said about Indian food, Pasha serves Central Asian food, and unless you're from that part of the world, or your family are, then we'd be surprised if you've been exposed to this particular cuisine. Serving food from Uzbekistan, Kazakhstan, Tajikistan and the other surrounding countries, this is a cuisine that uses a lot of meat, particularly mutton. If you do give it a go, remember to bring your South London Club Card, and get 10% off with your South London Club Card. You might be asking, what is the difference between Taiwanese food, and Chinese food? Well, China is a pretty big place, and the food varies quite a bit across the country, something that doesn't get properly represented in the UK. Taiwanese food however, is something of a regionalised version of Chinese cuisine, with a lot in common with Southern Chinese food, and an interesting Japanese influence. Bao Bao is one of the best places in South London to sample some Taiwanese food, and you get 10% off anytime with South London Club Card. Nepalese food reflects landscape of Nepal, and the myriad of borders that it shares. Featuring a lot of lamb, and influences from the surrounding cuisines like Tibetan, Indian and Thai. While there is a big Chinese influence, you'd probably say its closer to a curry. We're rather lucky in South London that we've got Gurkha Cottage in Crystal Palace, one of the finest purveyors of Nepalese food in London, and we're also lucky that they give you 10% off with your South London Club Card. Apparently Kelly Brook went there once, so, yeah, bear that in mind. Admit it, just admit it, explaining what British cuisine looks like to someone who isn't British is quite difficult. Sunday roasts? Britain can hardly lay claim to the concept of roasting food. Fish and chips? Maybe. One thing we can say is distinctly British, is pie and mash, Manze's of Deptford serves some of the finest pie and mash in the world. We're also delighted to be able to tell you that you are able to get 10% off at Manze's with your South London Club Card. Turkish food is one of the world's most popular cuisines, and the chefs at Saray do a ruddy good job of making a mark in a cuisine that has become somewhat ubiquitous across the UK and the world. From parcels of grilled meat, to chicken stewed with almonds, dried apricots and grapes, there is plenty to enjoy at Saray, and you can also enjoy the 10% off Monday - Thursday you get with your South London Club Card. Japanese cuisine is great, it's varied, it's interesting, it's tasty - it's just simply great. Sapporo Ichiban in Catford is one of the best places in South London to indulge in some Japanese food, and have some of their lovely sushi. A great spot for a date, you can get 10% off when you spend £15, but we wouldn't recommend telling your date about that. We continue our tour of the cuisines of South London, with a visit to The Rosemary, an independent Hungarian restaurant that calls New Cross its home. When we think of Hungarian food, most of us think of goulash, which is a a popular stew seasoned with paprika, but there is so much more to Hungarian food than that, and we'd recommend you go and find out, while also getting 10% off food (Tues-Thurs) and 10% off craft beer all the time with your South London Club Card. Okay, we'll admit,though Le Delice is a boulangerie, it does not provide a definitive French dining experience, it only provides one aspect of a French dining experience. However, in cases such as this, something is better than nothing, so we're adding Le Delice to this list. There is nothing wrong with that, because the cakes that they serve are absolutely wonderful. You can also get 10% off those same cakes with your South London Club Card. The Adobros are not, like most of the establishments we've listed here, a permanent restaurant - they are a supper club. Though they do have a permanent residence - their flat - we wouldn't go as far as to say they are a restaurant. Regardless though, they serve some mighty fine Filipino food, and they take their name from the national dish of the Philippines - the adobo. We won't ruin the surprise by telling you what the adobo is, we'll just assure you, it's amazeballs. The fact that you also get a free complimentary bottle of wine with every 2 bookings made as part of your South London Club Card is also amazeballs. Paella is a really, really wholesome dish, and just thinking of the stickness of the rice is enough to get us salivating. It's not common to come across a paella takeaway, but Morisco is just that, so if you're in, or around, the Streatham area, and need a takeaway for you and some friends, then Morisco is the place for you. It's also helpful that you get 10% off purchases over £15 with your South London Club Card. Straight outta Tehran, or any of the other cities in the Persian peninsula that you care to mention, Doost is a sophisticated Persian restaurant in Kennington that shows off what is best about South London - diversity, and high quality. Persian food involves a lot of kebabs, but don't be put off, kebabs don't have to be awful, in fact they are very easy to make wonderful. Your South London Club Card, however, means that you can get hgreat Persian food, and great prices as you get 10% off when you book in advance.